Flooding is becoming increasingly more common, leaving lasting consequences for landowners and homeowners. Once a river rises, it may be only a matter of time before it spreads into nearby properties or villages. Maintaining the integrity of properties and the safety of its occupants are key reasons why we are asked to surveying for flooding risk. They help to provide consultants with the information they need to take protective measures against flooding with a flood risk assessment. One of the projects we have been recently involved in is at Bywell, Northumberland. 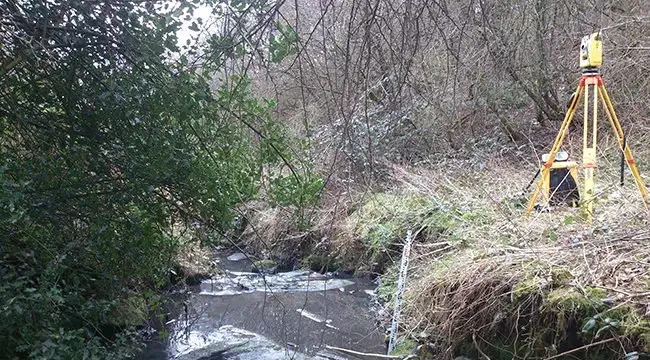 Working alongside Allendale Estates, Fisher German LLP, and JBA Consulting, we delivered a topographic survey and a river cross section survey on the River Tyne at Bywell as part of this project. The River Tyne had previously flooded Bywell village, making it important to properly take into account what had happened in the previous flood. We conducted an initial topographic survey of the existing flood defences that are protecting the village. From there, we identified the low spots and areas that require further defences, so that consultants can design remedial works. We also provided surveying data on the floor levels of the properties that had been affected by the flooding. In addition to the topographic survey, we conducted a river cross section survey. This required our surveyors to traverse the river. Our three man team used safety lines and a boat to effectively complete the full survey. This allowed us to determine the capacity of the river and produce a flood model. The river cross section survey was the most challenging part of the survey for us as we had to contend with the high flow of the river due to Kielder Reservoir releasing large quantities of water. This meant we had to carefully time when we did the survey within the three day period when no water was being released to make the survey as safe and accurate as possible. At the end of the survey we produced cross sections so that our clients could carry out further flood analysis. Once this analysis is finished, further preventative action will take place in the form of additional flood defences and adequate insurance coverage. Landform Surveys were only too happy to contribute to a scheme that will protect Bywell village from flooding in future years.